California’s criminal and juvenile justice system consists of the state correctional system, county jails and juvenile halls, probation departments, local law enforcement, prosecutors, and public defenders. The Budget Center provides timely research and analysis intended to help reform the state’s criminal and juvenile system, with the aim of promoting safer communities, better outcomes for individuals who come into contact with the system, and smarter choices about the allocation of public dollars. 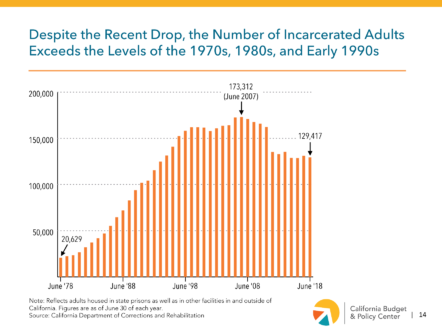 What is the current state of California’s corrections system? This Budget Center chartbook discusses the impact of recent criminal justice reforms, looks at the key challenges that remain, and explores the need to advance additional reforms moving forward. The 2018-19 state budget anticipates the end of California’s use of out-of-state prisons. This blog post provides background on our state’s use of these facilities and discusses how further criminal justice reforms are needed to more rapidly reduce incarceration. This interactive map tool and set of Fact Sheets provide data for county spending on both incarceration and responding to crime for selected fiscal years from 1990-91 to 2015-16.